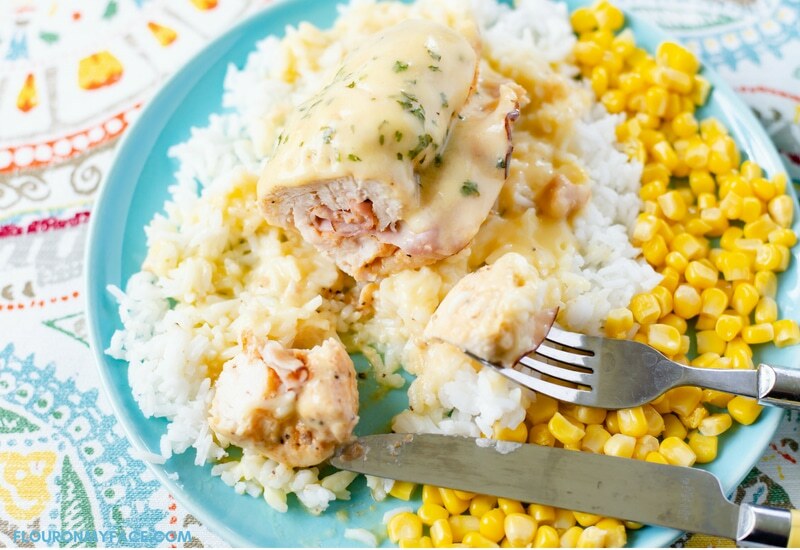 Crock Pot Chicken Cordon Bleu sounds like a fancy recipe, but it’s just stuffed boneless chicken breast rolls that taste amazing. 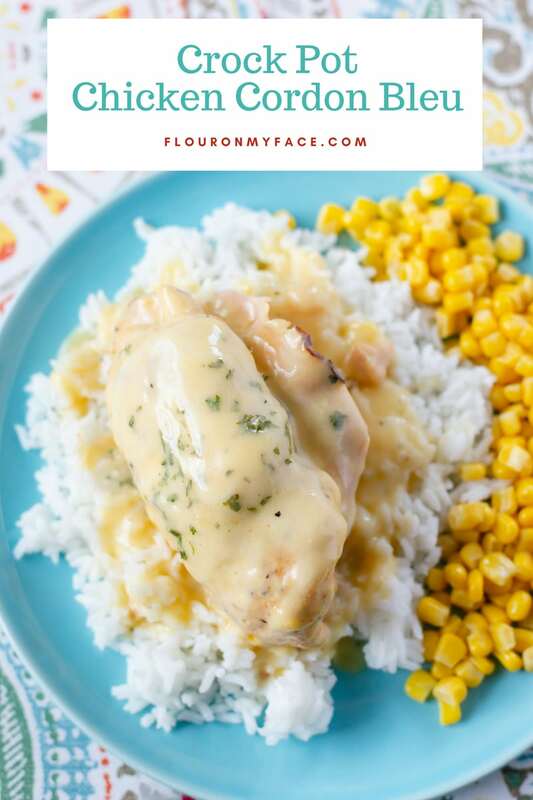 This delicious chicken crock pot recipe is so easy to make and requires only a few ingredients. 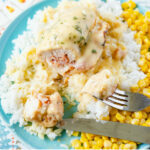 Imagine moist chicken breasts infused with the smokey flavor of ham and swiss cheese. The cream of chicken soup makes a great gravy to drizzle over the ham and cheese filled chicken rolls. 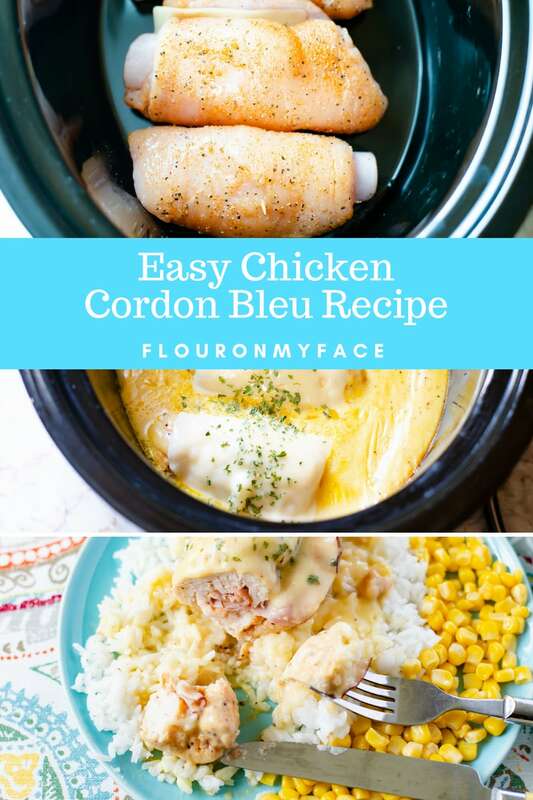 You can serve the Crock Pot Chicken Cordon Bleu over cooked white rice or wide noodles and make a full meal of it. I used medium sized chicken breast halves and pounded them flat with a metal meat mallet. Very large chicken breast halves are very hard to pound flat. If your pieces of chicken breast are very large and thick I suggest slicing them in half lenght wise before pounding them flat with the meat mallet. You could also butterfly the thick chicken breasts and stuff the inside with the ham and swiss cheese if you don’t want to pound them flat. I picked up my favorite ham at the deli counter of my Publix. Publix deli has a ham that is called sweet ham. It tastes just like baked ham and we eat it all the time on sandwiches. Using a meat mallet pound the chicken breasts until very thin (small chicken breasts work best for this). Season both sides of each chicken breast with the Lawrey’s seasoned salt and ground pepper. Make the chicken rolls by laying one slice of ham on top of the chicken fillet and topping the ham with a slice of Swiss cheese. Roll the chicken up from the narrowest end to encase the ham and cheese within the chicken breast. Use one or two wooden toothpicks to secure the stuffed chicken roll. Place the stuffed chicken rolls into the bottom of a 6-quart crock pot in a single layer. In a bowl or a (affiliate) 4 cup spouted measuring cup mix the cream of chicken soup, milk and a 1/2 teaspoon of ground black pepper. Pour the soup mixture over the chicken rolls. Place the lid on the crock pot and cook on high for 3 to 4 hours or low 5 to 6 hours. 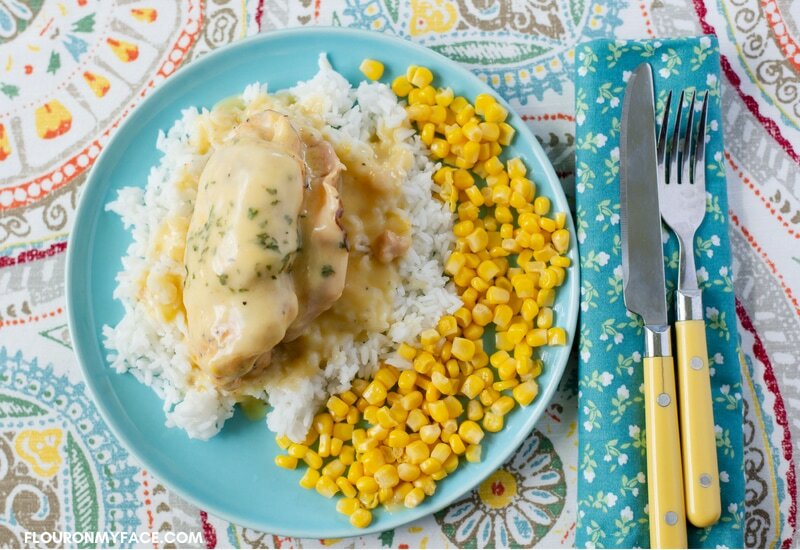 Right before serving lay a slice of Swiss cheese over each chicken roll and recover the crock pot. Heat until cheese is melted. Before serving remove the toothpicks from each chicken roll! Serve over a bed of cooked white rice. If chicken breasts are very large or thick carefully slice them in half lengthwise to make 2 thin chicken fillets or cutlets before pounding them thin. Cooking time will depend on the size of the chicken breasts used. Larger and thicker chicken breast pieces will require a longer cooking time no matter what setting you are cooking on. 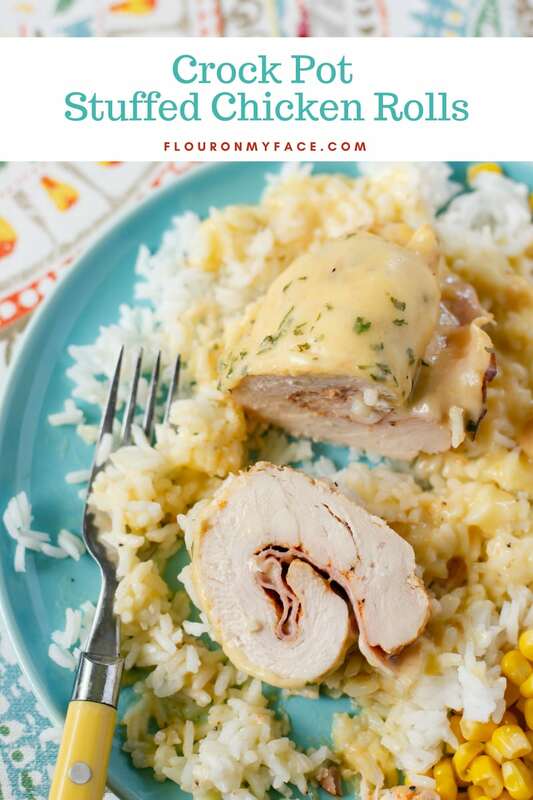 You could also make the stuffed chicken rolls and freeze them for any easy chicken freezer meal. Steel Meat Mallet: I use my steel meat mallet everytime I cook chicken breasts. Lawrey’s Seasoned Salt: Is one of my favorite seasoning to use when cooking chicken. Pyrex 4 cup spouted glass measuring cup: I love my 4 cup Pyrex measuring cup. It is big enough to use as a small mixing bowl and or a measuring cup. In a bowl or a 4 cup spouted measuring cup mix the cream of chicken soup, milk and a 1/2 teaspoon of ground black pepper.